These tools are V-Shaped in design, so the deeper the cut, the wider the mill path, allowing the same tool to mill a multitude of widths. All of the milling tools are made from Solid Sub-Micrograin Carbide. 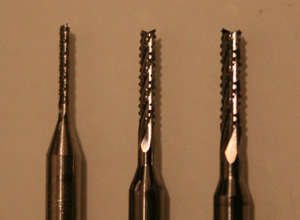 Larger view (in order of appearence in group photo): T1 Milling Tool, T3 Milling Tool, T4 Milling Tool, T8 Milling Tool. If you need accurate PCB drilling, then these superior quality German drill bits are what you need. The four-facet point geometry matched with High Micro-Flute, O.D. Finishing and Sub-Micrograin Carbide construction, provide unsurpassed drilling quality. 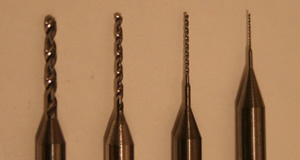 Drill bits available from 0.25mm to 3.175mm, all 1.5" long with 3.175mm (1/8") shank. These Carbide End Mills feature a premium surface finish that gives exceptional performance, effectively removing copper from your circuit board, cutting a perpendicular edged wall, giving a dependable milling width and removing a minimal amount of dielectric material. Larger view (in order of appearence in group photo): 0.031", 0.015", 0.01", 0.0625"
These Carbide Contour Routers create a superior, burr-free surface finish on a number of different materials. They easily provide contour routed edges for high-tolerance circuit dimensions and component fit and are available in 0.8mm, 1mm, 1.6mm, 2mm and 3mm diameter, with fishtail point.